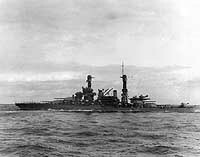 USS Colorado, a 32,600-ton battleship built at Camden, New Jersey, was commissioned in August 1923. She made an initial cruise to European waters in late 1923 and early 1924, then transferred to the Pacific, where she spent most of the remainder of her active career. 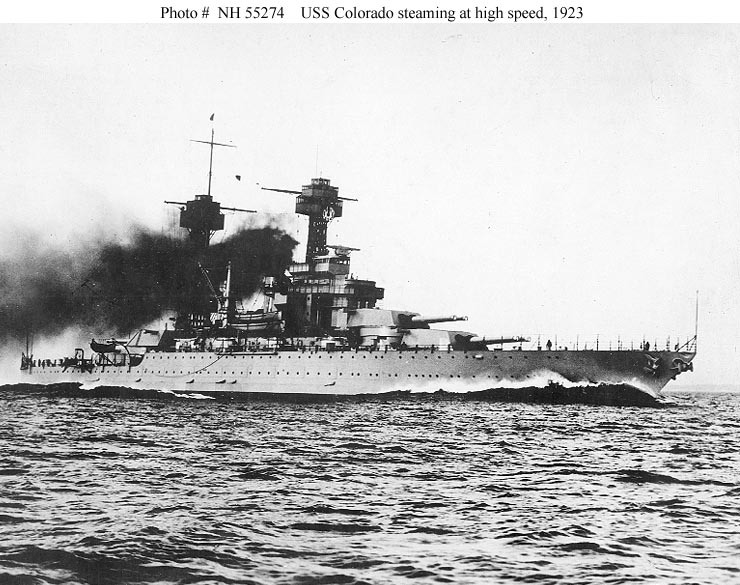 Prior to World War II, Colorado served with the Battle Fleet, taking part in exercises and training. Among other peacetime operations, she took part in the fleet's 1925 trans-Pacific voyage to Australia and New Zealand, and helped in the search for missing aviator Amelia Earhart in 1937. 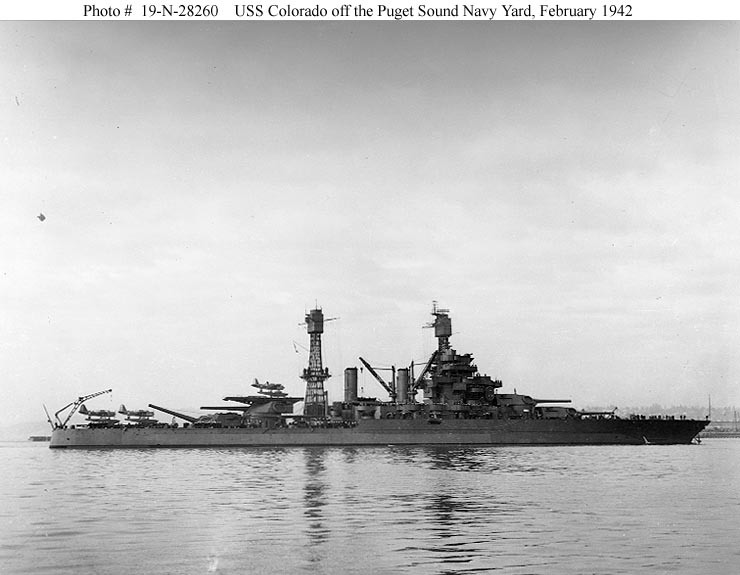 Colorado was undergoing overhaul at the Puget Sound Navy Yard when Japan's attack on Pearl Harbor opened the Pacific War. She was stationed on the U.S. West Coast during March-August 1942, then steamed west to Pearl Harbor. 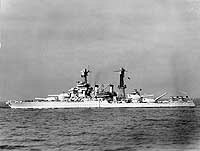 From November 1942 into September 1943, she was one of the older battleships deployed to the South Pacific to guard against possible Japanese offensive actions in that area. 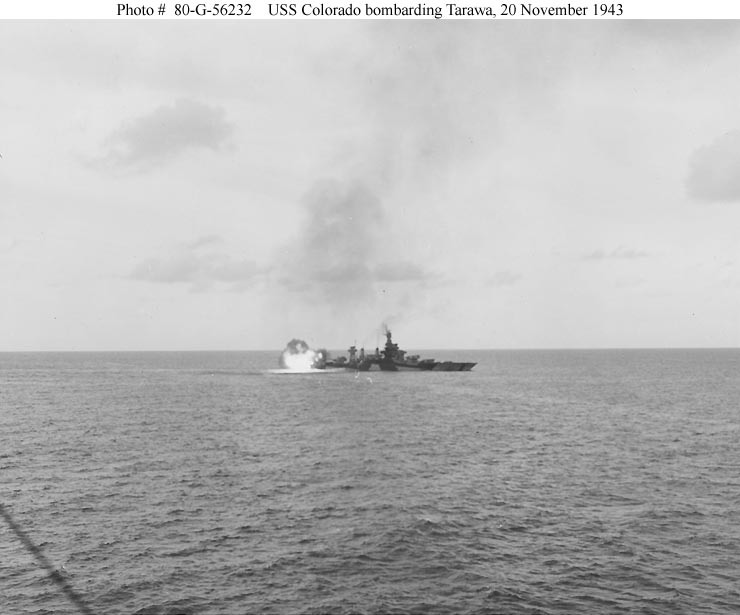 In November 1943, Colorado took part in the Tarawa invasion. She supported the landings at Kwajalein and Eniwetok in January and February 1944 and the Marianas operation in June and July. 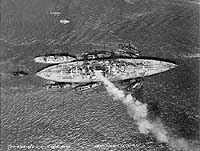 On 24 July 1944, while bombarding Tinian, she was hit by enemy shore batteries, suffering serious casualties among exposed personnel topside. 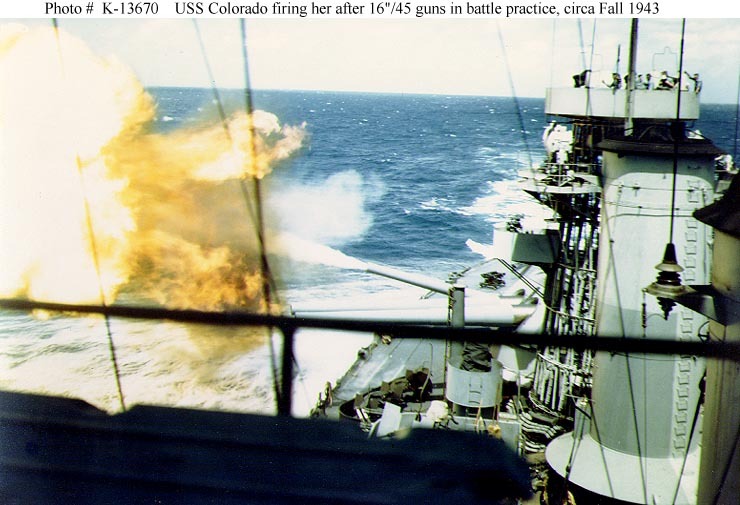 Colorado's next combat duty was off Leyte in November 1944, where she was hit by two "Kamikaze" suicide planes late in the month. Remaining in the combat zone, she supported the Mindoro invasion in December and the Lingayen Gulf landings in January. 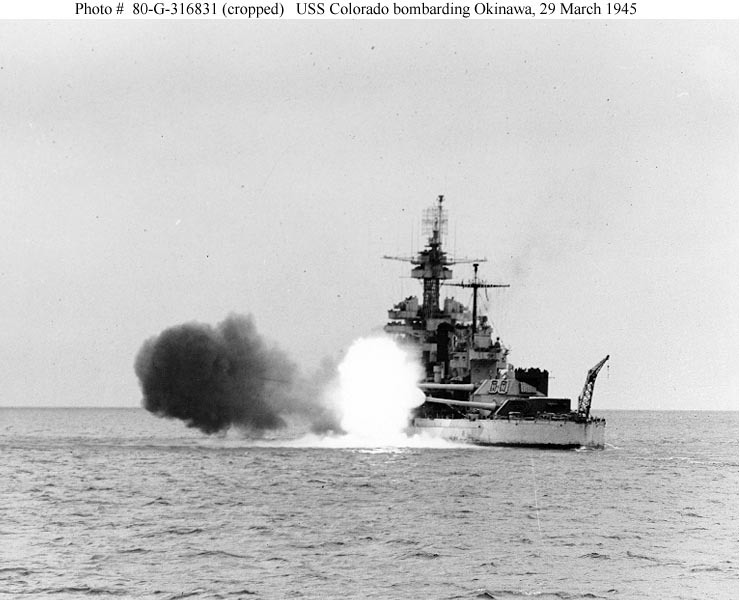 During March, April and May 1945, Colorado's sixteen-inch guns bombarded Okinawa in support of U.S. troops ashore. In August and September 1945, she covered the occupation of Japan, then departed for the United States. Following transport service in late 1945, she was inactivated. 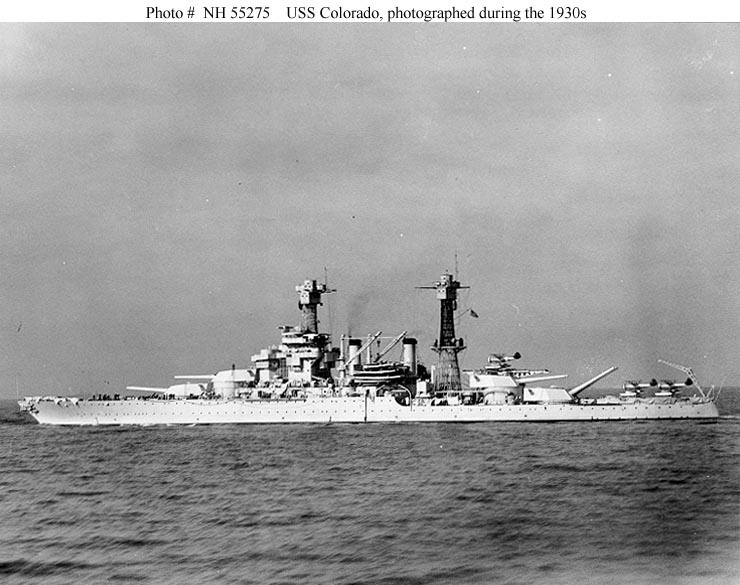 USS Colorado was decommissioned in January 1947. After more than twelve years in "mothballs", she was sold for scrapping in July 1959. 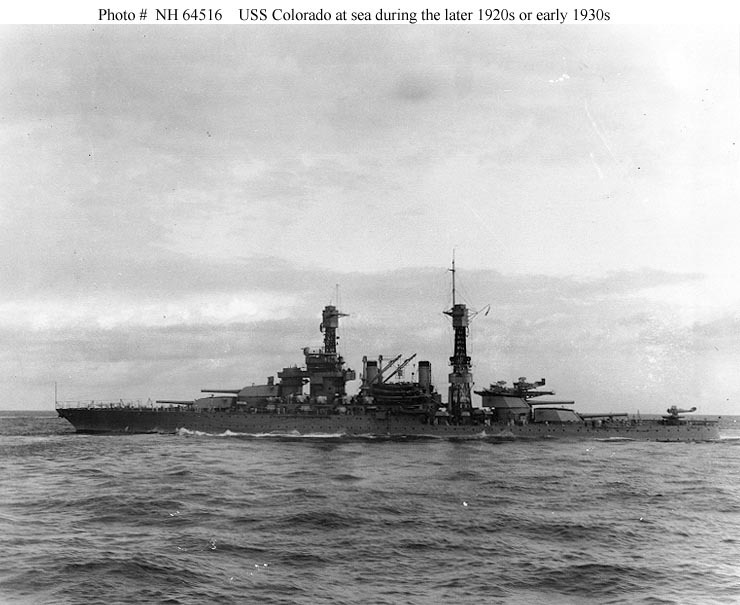 This page features selected views concerning USS Colorado (BB-45). 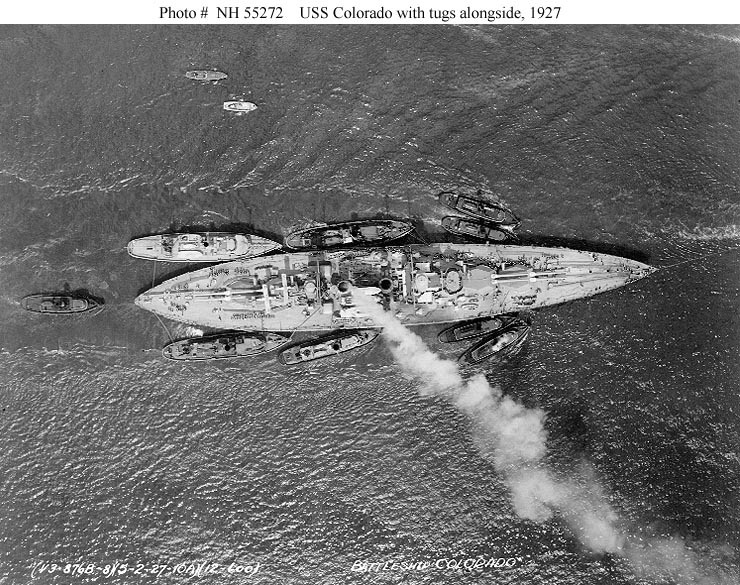 Vertical aerial photograph, taken in harbor on 2 May 1927 with three large and five smaller harbor tugs alongside and one astern. At sea off Honolulu, Hawaii, during the later 1920s or early 1930s. She has two Loening OL-6 on her turret catapult and one Vought UO or FU aircraft on the stern catapult. Donation of Franklin Moran, 1967. 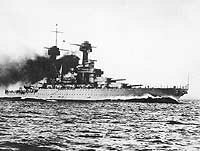 Photographed during the middle or later 1930s, after the addition of additional machinegun positions on her foremast top. Airplanes on her catapults are Vought O3U-3 "Corsairs". 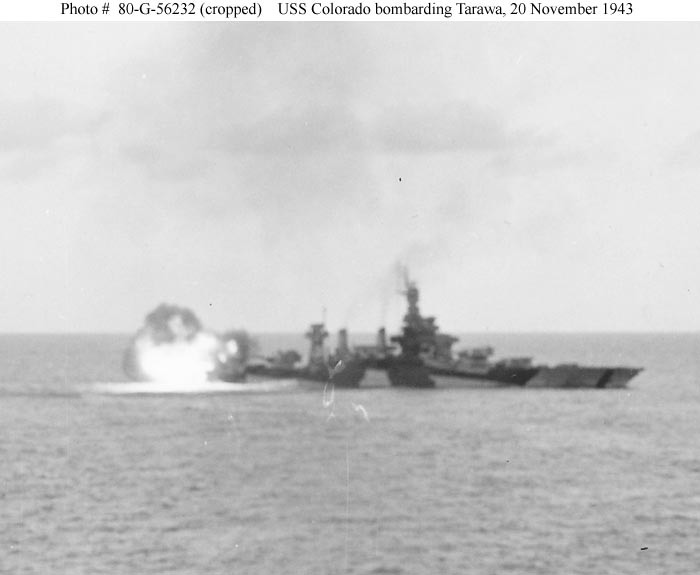 Bombarding Tarawa, 20 November 1943. 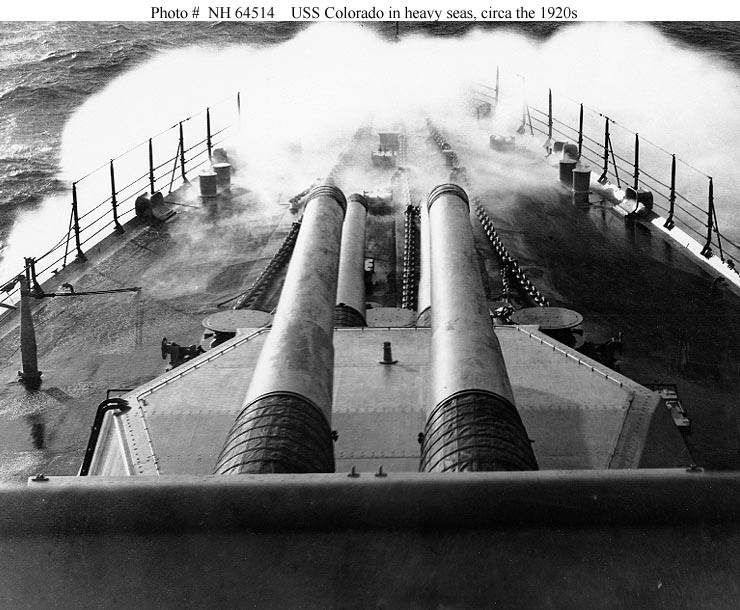 Photographed from USS Maryland (BB-46). Colorado is painted in Camouflage Measure 32, Design 3D. This image has been cropped from Photo # 80-G-56232 to emphasize the ship and her camouflage pattern. Arrives at San Francisco, California, on 15 October 1945, following the end of World War II. 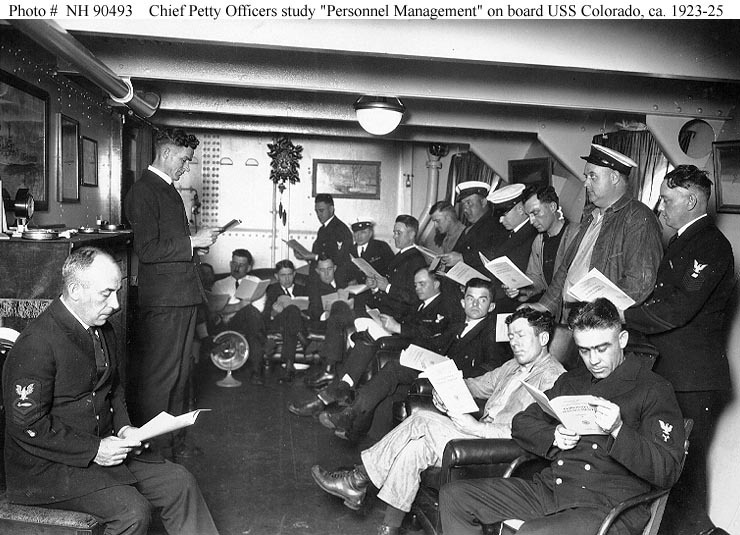 Chief Petty Officers study books on "Personnel Management", in the battleship's "Chief's Quarters", circa 1923-25. Note ornate cuckoo clock on the bulkhead in the background. Collection of Rear Admiral Bradford Bartlett, 1979. 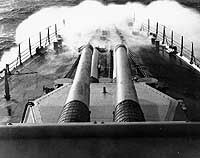 View looking forward from the bridge, as the battleship takes water over the bow while steaming in heavy seas, probably during the early 1920s. Her two forward 16"/45 gun turrets are in the foreground. 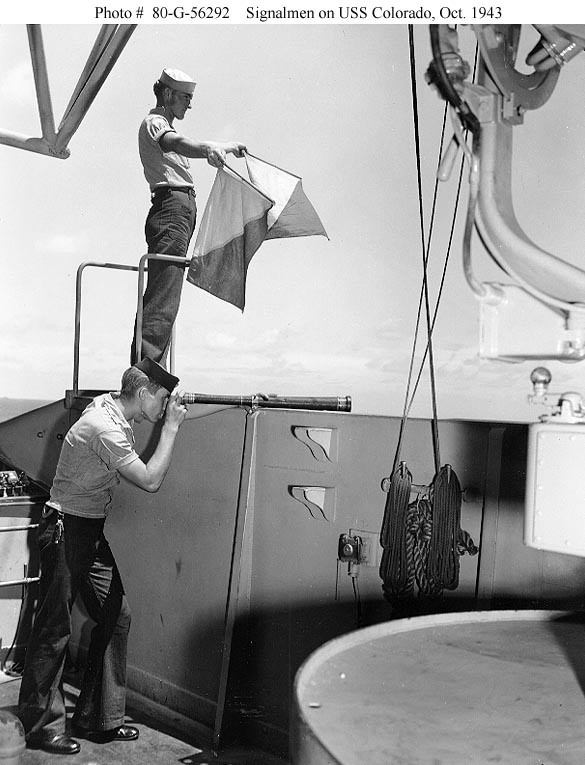 Signalmen sending a message with semaphore flags, on the battleship's signal bridge, 29 October 1943. 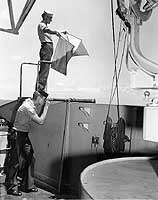 Signalman 2nd Class Kenneth Mitchell is working the flags, as Signalman 3rd Class John Wilson mans the telescope. Firing her after 16"/45 guns, during preparations for the Tarawa invasion, which took place in late November 1943. Crewmen visible in this photo are not in combat dress, indicating that the view was taken during battle practice. The images listed below are NOT in the Naval Historical Center's collections. DO NOT try to obtain them using the procedures described in our page "How to Obtain Photographic Reproductions". USS Colorado (BB-45) in a Pacific anchorage while wearing Camouflage Measure 32, Design 3D, probably circa mid-1944. The ship's paint appears to be rather worn. 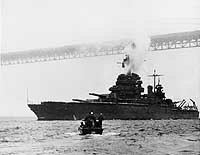 USS Colorado (BB-45) underway off Point Madison, Washington, 26 April 1944. She is painted in Camouflage Measure 32, Design 3D. Port stern (rather toward the broadside) aerial view. 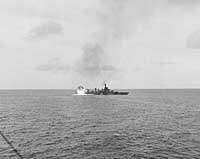 Reproductions of these images should be available through the National Archives photographic reproduction system for pictures not held by the Naval Historical Center. The images listed in this box are NOT in the Naval Historical Center's collections. DO NOT try to obtain them using the procedures described in our page "How to Obtain Photographic Reproductions".